In 2010 I began to apply dog therapy in my daily work and service to patients and their families. Hence, I provide dog-assisted therapy on a professional level, for which I am joined by my certified therapy dog called Snubbi, who is an English field trial (FT) Cocker spaniel – seen on the photos here. Yet, most of my current medical or scientific work does not directly include Snubbi, but when he is part of the program or interacts with patients, clients or their families, they are not only getting a broken part fixed, they are made whole again. The point is that applying a therapy dog as part of the medical profession is a natural, easy, safe and salutary approach to the benefit of patients and their families. This is supported by scientific research showing how therapy dogs and dog therapy reduce the burden of a vast range of disorders as well as they promote rehabilitation of patients and work wonders for their families. 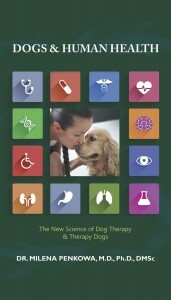 In fact, as the scientific proofs of dog therapy for human health grow rapidly, I decided to write a book about it. The book is based on medical research studies and hard data, however, I have written it in an easy-to-follow language, as the point is to share the information with anyone interested in dogs. Hence, no matter what is your professional background, you can read and enjoy the book about “Dogs & Human Health”. Noni on Are you suffering from a sensitive gut?